Have you ever wonder how the Swans did on a particular date in history or wondered which league or competition they played in? Well read on to find out exactly what happened, wherever and whenever the Swans played on 16th March. 1 year ago on 16 March 2015 – A string of fine saves from Simon Mignolet helped Liverpool to an undeserved 1-0 win at the Liberty Stadium in the Barclays Premier League. The 20,828 crowd witnessed a fortuitous second half winner for the Reds, when Jordi Amat’s clearance deflected off Jordan Henderson and into the net. 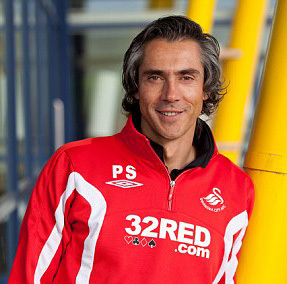 The Swans stayed in 9th place in the table as Liverpool recorded their first ever win at the Liberty Stadium. 6 years ago on 16 March 2010 – The Swans lost 2 nil to promotion chasing rivals West Bromwich Albion at the Liberty Stadium in the Coca-Cola Championship. The 17,774 crowd saw Roger East award a controversial second half penalty which helped the Baggies to victory and virtually put paid to any hopes Paulo Sousa’s team had of automatic promotion. The defeat meant the Swans slipped into 5th place in the table. 9 years ago on 16 March 2007 – Two goals in two second half minutes from Andy Robinson (pen) and Izzy Iriekpen gace the Swans a 2-0 win over relegation threatened Chesterfield at the Liberty Stadium in Coca-Cola League One. 12 years ago on 16 March 2004 – Republic of Ireland U-21 left-back Shaun Byrne was sent off as the Swans lost 2-1 at Macclesfield Town in Nationwide Football League Division Three. Brad Maylett scored a late consolation goal but it wasn’t enough to stop the Swans from losing to 2nd from bottom Macclesfield in front of a Moss Rose crowd of 1,513. Two days later Brian Flynn and his assistant Kevin Reeves left the club by mutual consent and were replaced by Kenny Jackett. 14 years ago on 16 March 2002 – The mid-table Swans beat automatic promotion chasing Mansfield Town 2-0 at the Vetch Field in front of a Nationwide Football League Division Three crowd of 3,527. A goal in each half from Steve Watkin (pen) and a 25 yard screamer from David Romo were enough to see the Swans get all three points. 20 years ago on 16 March 1996 – Jan Molby suffered his first defeat since becoming the Swans manager as they lost 2 nil to Blackpool at the Vetch Field. Despite Roger Freestone saving a penalty, the 4,478 crowd went home disappointed after watching league leaders Blackpool truimph. The Swans meanwhile languished in 21st place in Endsleigh Insurance League Two. 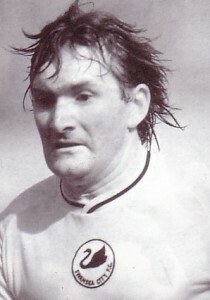 30 years ago on 16 March 1986 – Tommy Hutchinson’s Swans were hammered 4-1 at fellow relegation strugglers Lincoln City in Canon League Division Three. Roger Gibbins scored the Swans consolation goal in front of a Sincil Bank crowd of 2,846. The result meant the Swans stayed 2nd from bottom. 34 years ago on 16 March 1982 – Goals from Leighton James and Alan Curtis earned the Swans a 2-1 win at Bangor City in the Welsh Cup Semi-Final 1st Leg. 37 years ago on 16 March 1979 – The Swans beat Gillingham 3-1 in a top of the table League Divsion Three clash at the Vetch Field. The 10,382 crowd retain 3rd place in the table thanks to strikes from Alan Curtis, Alan Waddle and a John Sharpe own goal. 40 years ago on 16 March 1976 – League Division Four Swansea beat Doncaster Rovers 2-1 at the Vetch Field in front of a crowd of 3,128. A goal from Geoff Bray in the first half and a second half Steve Wignall own goal were enough to give the Swans all 2 points. 42 years ago on 16 March 1974 – On what was a rare Saturday lunchtime kick-off, the Swans lost 2 nil to promotion chasing Peterborough United at the Vetch Field in the Football League Fourth Division.